Folks we are right in the middle of LOVEfest (a week long competition of finding hearts and love images all around us) shared on instagram and snapchat. So today’s choice for Woman Crush Wednesday couldn’t be any more perfect! 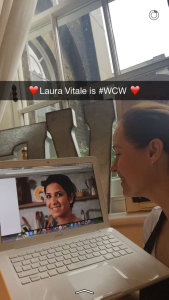 The absolutely stunning Laura Vitale is all about the LOVE, which she shares through her recipes and her warm and inviting personal style. Originally from Italy (hello, that partly explains the Amore) she moved to America at the age of twelve. A self taught cook who worked in her father’s restaurant before starting her famous Youtube Channel, this woman can pretty much cook anything! And she does. Yet, you will also find recipes for simple things such as an egg salad sandwich. Why? Because she is so interactive with her followers that she encourages requests. And if some people want to know how to make the perfect egg sambo, then she will do a tutorial. She’s not a foodie snob. She loves all food! That fondness spills over onto her followers, whom she affectionately refers to as “my loves”. At this juncture, her “loves” amount to over 2 million on her youtube channel alone (count me one of them). Laura recently launched her long awaited and successful cookbook Laura In the Kitchen. Though I haven’t found it in a store here in the U.K. I plan to pick one up when I travel to the U.S. soon. I really have this burning desire to support her as she is a massive inspiration to me. Before mid August, I have to admit, I hadn’t ever heard of Laura Vitale. As you know if you’ve been following me, I am very late to the social media world. And working three jobs in the food business while living in Dublin the last seven years gave me little time to peruse anything foodie outside of my world. However, all that changed when I was flying back from the U.S. and picked up a copy of the August 10th issue of People Magazine. In it there was a photo of Laura and one of her recipes. Though I was in People Magazine once, I never had the honor of having one of my recipes in there. Wow! So awesome! I started to explore a bit about her as I finally had more time for those things since moving to London. I instantly felt a kinship with her in terms of how she used cooking to lift her spirits, how she shared a deep gratitude for her husband as I do mine, and her silly and quirky ways. Like, duh, I’m a total goof ball too! 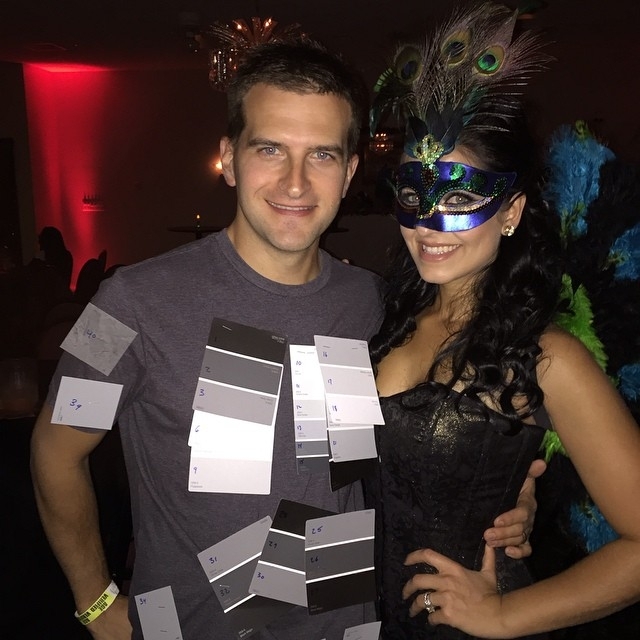 The Vitales even have a sense of humor in their themed Halloween costume choice (50 Shades of Grey). Okay, well Hubby and I haven’t done that yet! I started to watch her Youtube channel and was amazed at the amount of content she has, over 1,000 videos! Those are just the cooking ones. 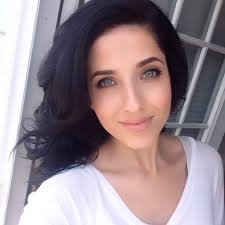 She also has many on style (she is very girly girly and loves to dress up and wear makeup) and she and her hubby Joe have a vlog that gives viewers a glimpse into their personal world. My favorites are the ones where they are traveling to Italy to visit her family. I happen to love Italy, but also love them because it is very heartwarming to see her with her granny (Nonna) and all her relatives. Plus it’s always impressive to hear her speak Italian! Laura Vitale has a purpose built kitchen in the basement of her home just for filming her cooking show. In fact, even with a recent move of house, they recreated the kitchen (which her viewers have become attached to) in their new home. This has allowed her to film at any time of day or night (with the help of proper lighting etc) without disrupting the rest of the house. The good news is that she never runs out of ideas for tasty treats! 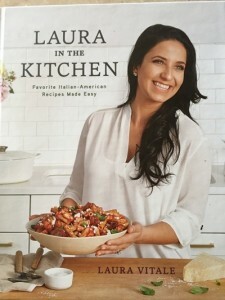 The Cooking Channel has also been featuring her in a show title, Simply Laura, so you can get your daily dose of LV! When thinking about which recipe of hers to make it was a tough decision. However, with Thanksgiving coming up, I was liking the idea of making one of her side dishes. And also, one that could be used throughout the entire year, not just during the festive season. 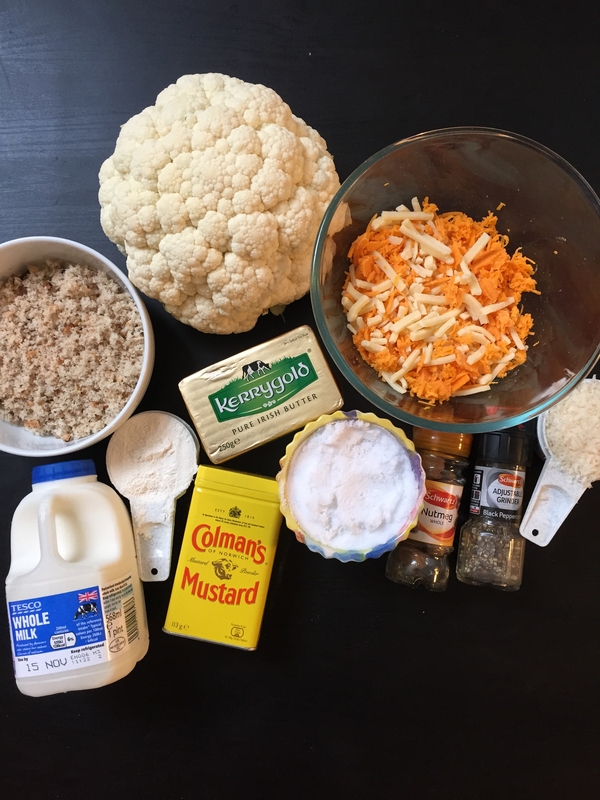 Her Cauliflower Gratin looked so good that I couldn’t resist. 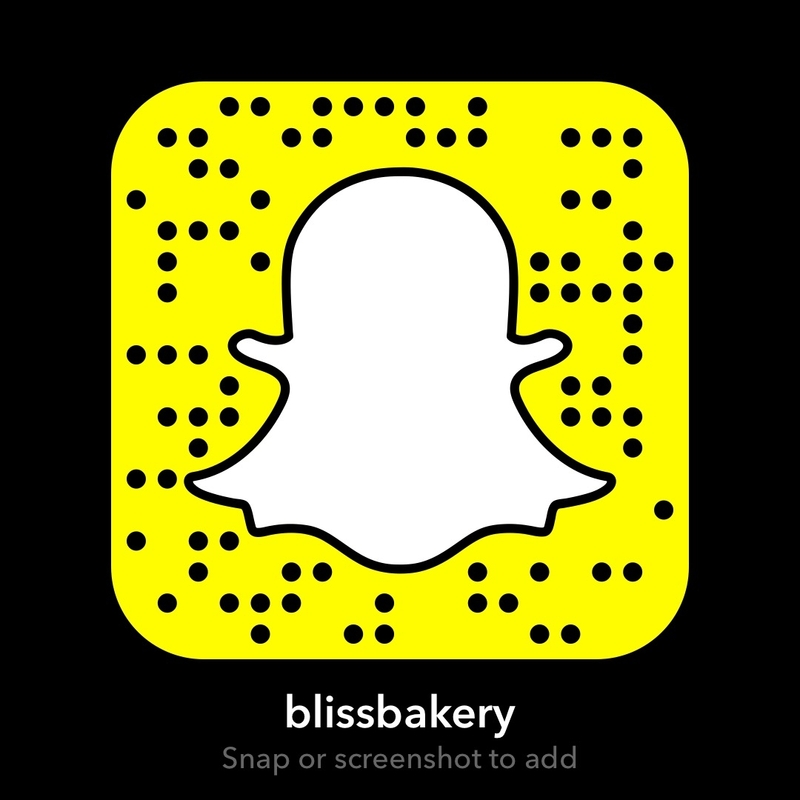 It is a very straight forward recipe as well, since I am doing a demo for my snapchat (username: blissbakery) it helps to have one that won’t take too long. As well, the ingredients are easy enough to find at any local grocery store. Living in Ireland for so long, I know how much they appreciate a warm comfort food recipe. Ireland has the best cheese too so they like to incorporate it into many dishes. 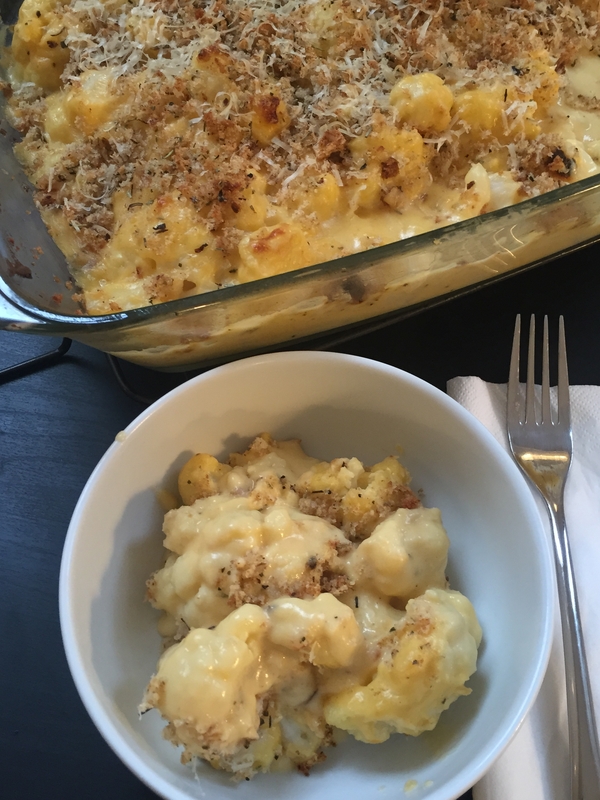 This cheesy cauliflower is so moreish that it could be eaten as a main course for a meatless meal (just add a mixed leaf salad on the side). Or it can be served as a side dish along with a lovely roasted chicken that I already shared on here. 1) Preheat the oven to 400 F/200C degrees, grease a baking dish with some butter and set aside. 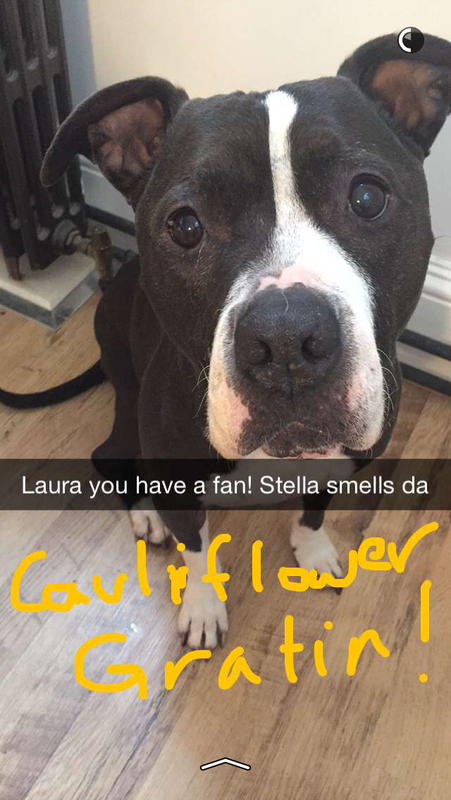 For those of you who haven’t met Laura before, I am happy to make the introduction. For those of you who have been with her since the beginning, how fortuitous! Laura, you are a most worthy Woman Crush Wednesday! Our first three ladies were from Ireland (my soul home). Our last three were from here in the U.K. (my current home). Now that Yankee Doodle Paddy has skipped across the pond to choose the seventh #womancrushwednesday (the first one from America, my birth home), I hope that 7 is your lucky number! Because you have certainly hit the jackpot with this recipe! LOVE it and LOVE you! Keep up the amazing work you and Joe are doing!